Check out the Jan 2014 session here! With a slow, deliberate build, the Ballroom Thieves make their presence known onstage immediately as the first chord is struck, transforming any size room, whether it be a large ballroom or a small club, into a remarkably intimate environment. Formed in 2011, the Ballroom Thieves take the sincere, narrative blueprint of folk music and infuse it with the attitude of rock, the soul of blues, and the sweat and fervor of a revival tent. That spirit makes its way into both their recorded music as well as their live performances, as Martin Earley (guitar, vocals), Devin Mauch (percussion, vocals), and Calin Peters (cello, vocals) attack their instruments and harmonies with the same energy onstage as in the studio. Garnering regional and national acclaim for both of their releases to date, 2012’s The Devil And The Deep, and 2013’s self-titled EP, the Thieves have been branching out from their native Boston. 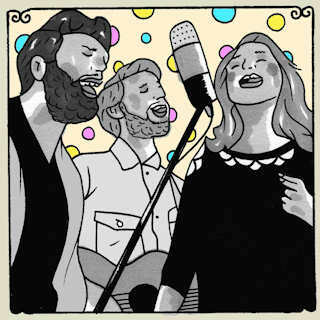 Their energy, passion, and songwriting craft earning them national touring spots with established bands such as the Lone Bellow, Dispatch, Little Green Cars, the Wheeler Brothers, and Houndmouth, among others. 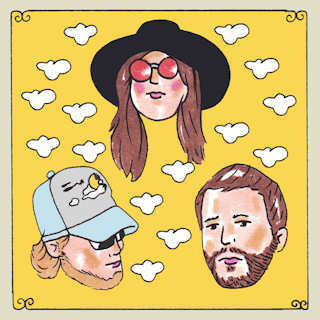 Truly a high-energy rock trio performing under the guise of well-crafted, emotionally sincere folk, the Thieves have released two well-received EPs since getting their start three years ago. With a strong presence in the Boston area and New England, they have received press from local blog luminaries such as Allston Pudding, who said of the Thieves live performance, “The intensity and passion The Ballroom Thieves had for the songs they delivered- it was hard to believe it was just three of them.” The Thieves have begun to branch out from New England, touring around the country with well-known stalwarts such as The Lone Bellow, Dispatch, Railroad Earth and Houndmouth, among others. Their first EP, The Devil and the Deep, placed a heavy emphasis on experimentation and finding the identity of the band’s sound. Tracks range from uptempo rock beats (“Loose Lips,” “Vampires”), to slower, more soulful tunes (“Save Me,” “Delia”). “Wait for the Water” is is a homey, folk classic in the making, with a slow single-guitar buildup making way for a boot-stomping finale, complete with banjos and those trademark soaring three-part harmonies.